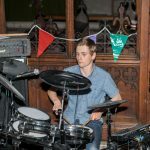 The 3rd weekend in July was a feast for music lovers in the Forest of Dean, for whilst Coleford’s Music Festival brought large numbers in to the area, Mitcheldean Parish Church played host to a stunning showcase concert featuring seventeen acts over more than eight hours. Following the presentation of the British Empire Medal to Pam Martin by the Lord Lieutenant of Gloucestershire, guests and parishioners were treated to some fine country dancing by the children of Mitcheldean Primary School. 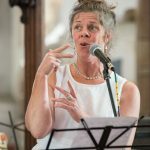 The concert itself commenced with a virtuoso performance of Spanish guitar playing by eleven year old Finn Wicks, whose control and artistry stunned the audience, impressed by a skill that belied his young age. 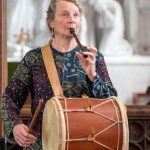 The Minstrels of the Forest treated everyone to a display of Early Mediaeval music, both performing and explaining the traditions of a genre that was matched by their period attire. 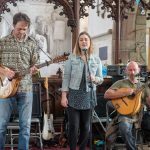 A change of mood and era was signalled by Vapor, a trio featuring stunning soulful vocals by lead singer Onika, accompanied by guitarist Mark Venus and guest saxophonist Tom Selway. 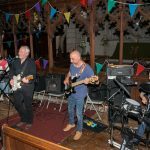 Their powerful and professional performance of mostly original ballads echoed a quality that is matched on their two recent CD recordings. 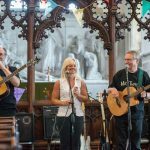 Travelling all the way from Shropshire was the highly impressive Kim Lowings Trio, a pared down version of the band who recently released their acclaimed album Historia. Fetauring Kim as lead vocalist and accompanied by guitars and citern, their impressive set featured a range of songs that told stories augmented by sweet stirring vocals and accomplished musicianship. 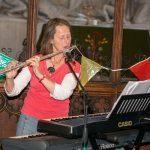 There followed an engaging performance by Mitcheldean’s own Tracey Dixon, whose vocal dexterity and lilt is well known to regulars at Mitcheldean Folk Club. 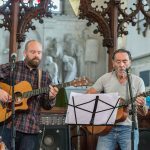 Accompanied by Jules de Bharra for some songs, Tracey’s haunting songs held everyone spellbound and were received with rapturous applause. 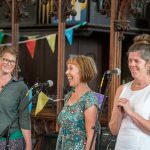 In mid-afternoon both audience and stage were swelled by the arrival of the Primary School Choirs, a collection of over thirty children from the Primary Schools of Walmore Hill, Blakeney and Pillowell. 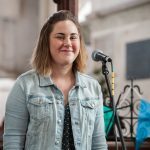 Their performance of traditional and contemporary songs wowed the church crowd, supplemented by individual youngsters reading a selection of well-chosen poems. 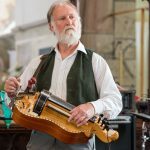 There followed Bygonz, a duo featuring Gillian and Rob Guest, whose performances on pipe and tabor, English bagpipe and hurdy-gurdy gave everyone a highly entertaining tour through the traditions of music and songs from an age long gone but not forgotten. 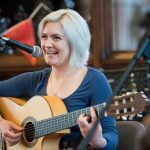 Guitarist and vocalist Rebecca Kay then entertained us with a selection of elegantly crafted ballads, also creating some engaging harmonies when accompanied by guest vocalists who joined her on stage. Festival and folk club stalwarts Greenwich Village have grown in confidence and skill with each appearance in Mitcheldean, and this guitar duo of Clive Shaw and Simon Richards from Lydney did not disappoint, with powerhouse guitar playing, augmented by vocal harmonies and harmonica, giving festival-goers a taste of American influenced country folk-rock. 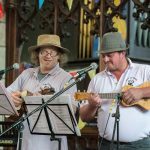 Following were Uke in Hand, who eminate from Drybrook’s Rose in Hand pub, which has played host to budding ukulele players from around the Forest. They treated us to some clever arrangements of familiar songs old and new which went down well. 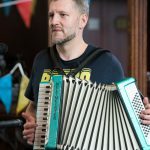 In the absence of Jimbob James, our very own busking bus driver Ben Coulson proved an admirable deputy, and his accordion accompanied tour of original Gloucestershire bus songs and familiar strains had the audience all joining in with his very singable choruses. 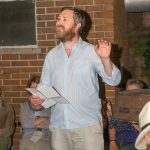 At 6.00pm MC Clint Mann took to the stage to perform, mixing songs of the Forest and its mining history with more energetic thrashing guitar songs about celebrating of the glories of life. Again, the audience joined in with choruses and foot stomping. Jules de Bharra was next up. 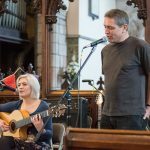 Ably supported by guest vocalists including husband Ian, she once again treated us to subtle and beautiful arrangements of mostly contemporary songs, some with a touch of ukulele. 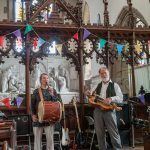 May Thrill are another act who have been regulars in Mitcheldean and beyond, and their set this year saw the trio accompanied by piper Polly, creating a stirring mix of traditional folk tunes and songs with their usual distinctive twist. The last three acts provided a fitting climax to the show. Asha Faria-Vare is a singer-songwriter whose lilting vocals and delicate guitar-playing enhance original songs that tell stories about relationships, saxophonists and political protest. Accompanied on some songs by her father, Asha held everyone spellbound with one of those “your could hear a pin-drop” performances. 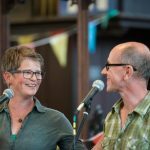 A change of style was signalled by Mice in a Matchbox, a duo from Oswestry. 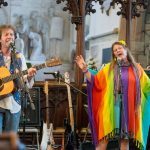 Sally Stamford’s gushing and gorgeous vocals were accompanied by Jim Rolt’s lively guitar to produce a highly entertaining set that was influenced by their experience of sailing around the Caribbean and selling lemonade, giving everyone bucketloads of fun. 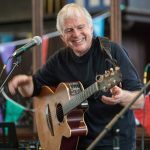 The evening was rounded off by the ever popular Crooked End who fused progressive rock, jazz and folk in a virtuoso performance of such complexity that the word unique could not be used as a cliché. 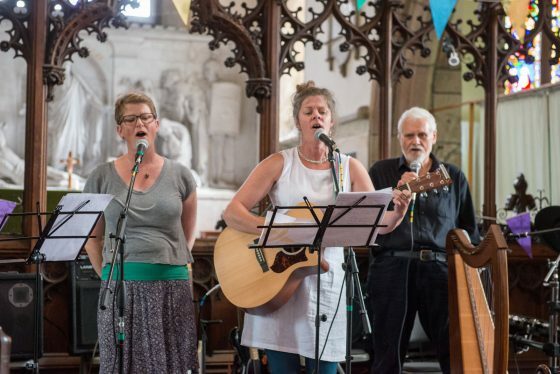 Built around the Taylor family from Ruardean, they provided a distinctive brand of excitement and skill that proved a fitting end to this year’s Showcase Concert. Last but not least, the whole experience in Mitcheldean Church was enhanced not only by the dedicated team of parishioners who served food and drinks throughout the day but also the amazing technical wizardry of Dave Stephens, who ran the sound desk throughout the whole event and provided swift changeovers and a fantastic sound system for a concert that showcased the amazing range of talent from the folk of the Forest and beyond, and which many suggested was the best one yet. Onwards to 2017!